Portsmouth Historic Dockyard allows you to discover the world famous historic ships - HMS Victory, the Mary Rose& HMS Warrior 1860 that have shaped British history at Portsmouth Historic Dockyard. Recently HMS M33 has also been opened to the public, more details about M33 can be found here. Another recent addition is Boathouse 4, more details can be found here. Other attractions include The Royal Naval Museum, with a new Exhibition "Dreadnoughts - The Ships & the Men who Built, Lived and Fought in them", and Action Stations with the brand new interactive gallery InterAction detailing the science and technology used by the modern Royal Navy. 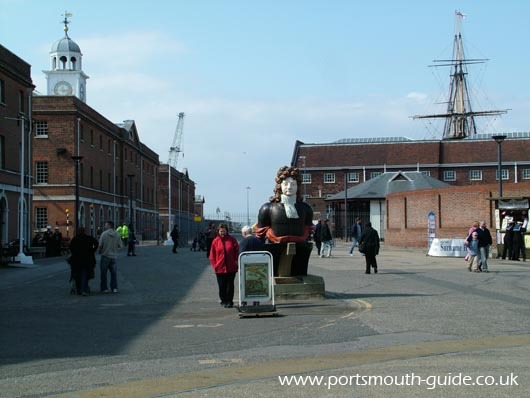 In addition to these permanent attractions there are frequently other attractions and events held in Portsmouth's Historic Dockyard. There are also opportunities to take Harbour Tours, enabling you to see the fleet up close. There is also the Dockyard Apprentice Museum housed in boathouse no 7. 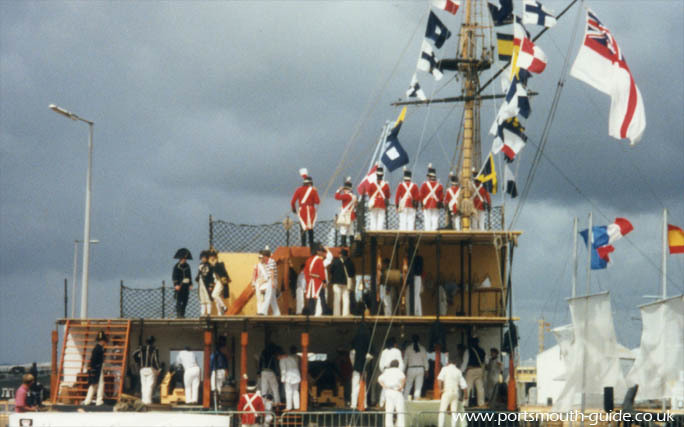 The above photograph shows 1805 Live, which was a re-enactment of the battle of Trafalgar. This was presented alongside HMS Victory which was an ideal setting for it. This was part of the Dockyard Festival of 1996, there was also an opportunity to visit many parts of the dockyard usually unseen by the public. In the early 1800s the Admiralty purchased 100,000 blocks on average per year and a Blockmakers' contract was worth about £34,000. The Blockmills situated inside the naval base were built by Brunel and in 1801 Brunel took out patents for some machinery. At the time there was machinery such as treadle lathes and saws, mostly worked by water or horse power, these were used for manufacturing ship parts. The old engine house, seems to have been demolished and the South Block of the Blockmills was built in 1800 together with the North block. It took Maudslay and Brunel until October 1803 to manufacture and install enough machines to begin production in the Blockmills, it was not until 1808 that the 45 machines were all finally completed. Production started with the large sets of machines running out each day 36 blocks, with 10-inch shivers, including a fair percentage of 2-shiver blocks, and the small sets 500 seven inch block a day. At maximum production 140,000 blocks were produced a year. In 1964 there were still 21 machines for preparing shells, 16 for preparing sheaves and 8 other machines left from Brunels originals. Using machines greatly increased the number of blocks produced a year and decreased the cost of the blocks. Much more information about Brunels Blockmills can be found in "Brunels's Blockmills" by Robert Sutherland Horne, L.R.I.B.A., H.M. Dockyard, Portsmouth which can be purchased from the Portsmouth Royal Dockyard Historic Society. In 1495 Portsmouth got the first dry dock in the country. In 1850 Portsmouth Dockyard covered a 99 acre site and Portsmouth Historic Dockyard and Naval Base now occupy 300 acres of space. The gate into Portsmouth Historic Dockyard 'Victory Gate' was completed in 1711, the mast pond which is between boathouse 7, 6 and the Mary Rose exhibition was excavated in 1665 by soldiers, townsfolk and Dutch prisoners of war. The pond is linked to the harbour by a tunnel under the road. The Storehouses were built in the 1760s to house the stores and equipment for the ships. The clock tower on the top was completed in 1992 and is a replica which was destroyed during 1941. The Naval Academy was completed in 1733 and housed 40 students. From 1906 to 1941 it was the Royal Naval School of Navigation. An event which has been held here is The Festival Of The Sea which was first held during the summer of 1998. In 2008 Portsmouth saw the first Meet Your Navy event, more information about that event can be found here and in 2009 the dockyard hosted a Royal Navy Past and Present event. For more details about Portsmouth's Ghost Ship Pageant please click here.